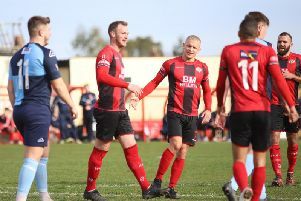 Marcus Law insists there will be no “added pressure” placed on the Kettering Town players for this weekend’s top-of-the-table showdown at Stourbridge. The Poppies were denied the opportunity to take over at the summit of the Evo-Stik League South Premier Division Central after their home clash with Coalville Town fell foul of the wintry conditions on Tuesday night. Having beaten Royston Town 1-0 last weekend, a result that was coupled by a surprise 2-1 defeat for Stourbridge at Hitchin Town, it means Law’s team head to the West Midlands trailing the leaders by one point with two games in hand. And while the clash is easily the biggest of the season so far in the division, Law insists his players will simply go and give it their best as they bid to take hold of the title race. “I think last weekend showed there’s going to be plenty of ups and downs,” saw Law, whose team beat Stourbridge 4-2 in the reverse fixture in November. “We know a positive result for us puts us in a strong position but I don’t think it will be the be-all and end-all purely because there are plenty of games left after this one in which there will undoubtedly be some strange results. “It’s first against second and we are looking forward to it. We will go out and give it our best but we certainly won’t be putting any added pressure on the players and make it a case of needs must. “Stourbridge might see it differently, especially with the fact we have the games in hand. With the battle for the title intensifying by the week, Law knows there will be “the normal reflection and reaction” no matter what the outcome of Saturday’s clash is. But he firmly believes his team can approach the game with confidence. “There will be the normal reflection and reaction to whatever the result is and everyone will come up with the mathematics of what needs to be done,” the Poppies boss added. “But it’s football. It’s 22 human beings and as much as both managers and sets of fans will want the perfect performance, we have seen that errors can and will be made. The Poppies will be without one key player for the encounter with pacey frontman Rhys Hoenes due to serve a one-match suspension.